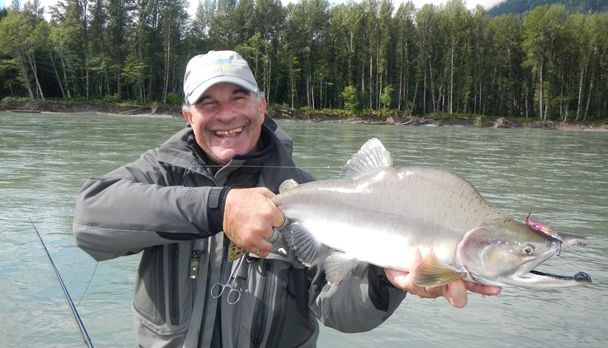 Skeena Region offers the finest fishing opportunities in the world for Trophy Steelhead, Chinook (King) Salmon and Trophy Coho. 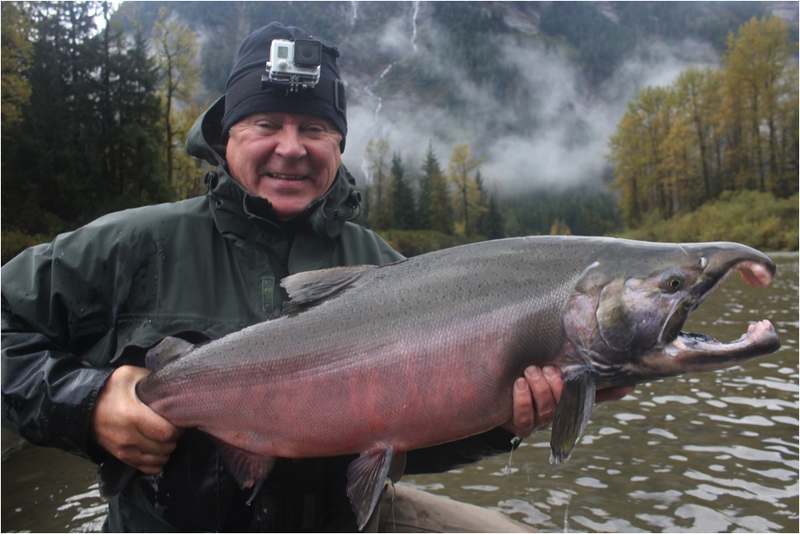 Steelhead are impressively large and 100% wild. They average 8 to 15 pounds, though 15 to 20-pound fish are not uncommon, and each year fish over 20 pounds are caught. The chances of catching one over 30 pounds, are always present!. 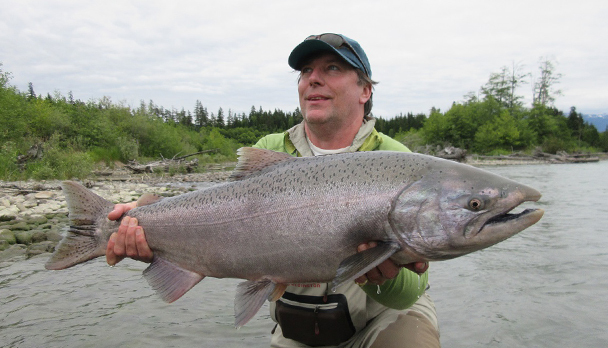 Chinook can average 20 to 40 pounds and range up to 80 pounds, and beyond (Skeena's biggest have been known to reach 100 pounds). Terrace is located in the northwestern corner of British Columbia near the Alaskan border, in the heart of the coastal British Columbia rainforest. 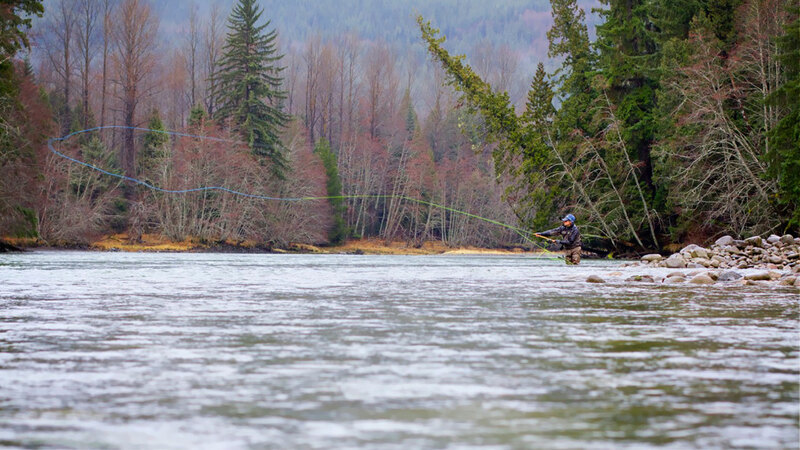 With rugged mountains climbing 10,000 feet straight out of the ocean, snow capped peaks, and towering cedar trees that are thousands of years old, the lodge is situated in an exceedingly beautiful area, with arguably some of the best Steelhead and Salmon fishing available in the world. 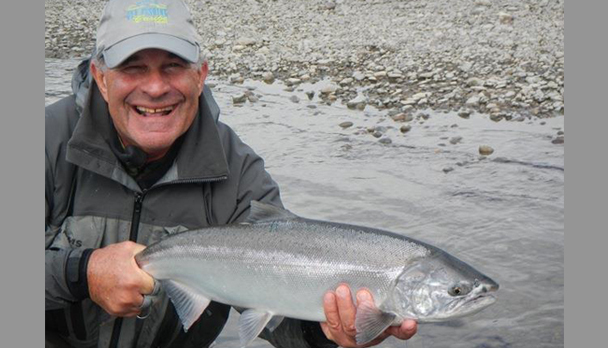 The operation has several government allotted licenses and rod days on the Lower Skeena region's best classified waters, including the Upper Copper, Lower Copper, mainstem Skeena, and Kalum. There's also access to 50 different unclassified rivers, lakes and streams such as the Kitimat, Nass, Bell Irving, Meziadin, Kasiks, Exstew and Exchamsiks. This not only ensures that our clients enjoy the best fishing opportunities available in the region, but also enables clients to have a different experience almost any day of the week. 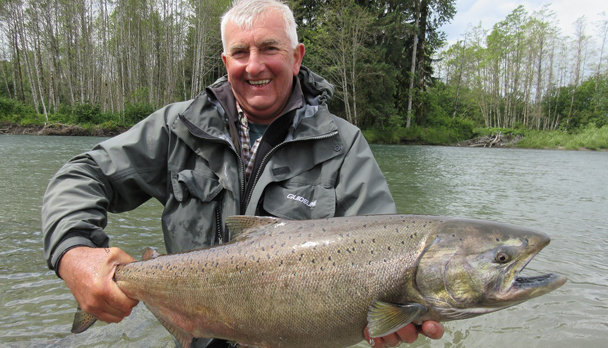 Skeena Region offers the finest fishing opportunities in the world for Trophy Steelhead, Chinook (King) Salmon and Trophy Coho. 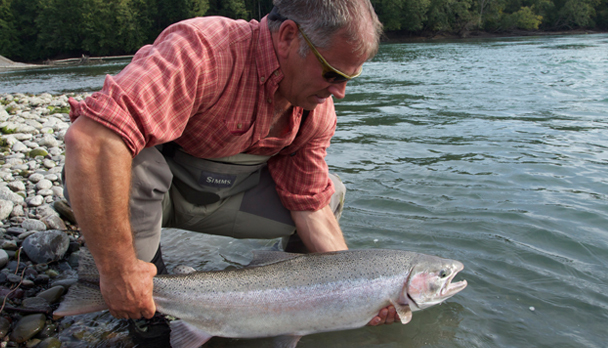 Steelhead are impressively large and 100% wild. They average 8 to 15 pounds, though 15 to 20-pound fish are not uncommon, and each year fish over 20 pounds are caught. The chances of catching one over 30 pounds, are always present!. 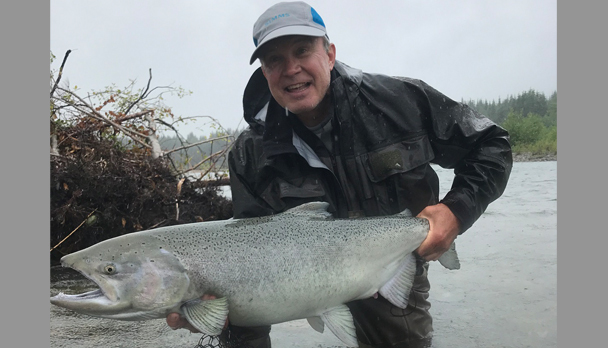 Chinook can average 20 to 40 pounds and range up to 80 pounds, and beyond (Skeena's biggest have been known to reach 100 pounds). The staff will pick you up from the airport and drive you to the lodge in Terrace. The ride is around 20 minutes approximately and on the way to the lodge, you will be driven through downtown where there are plenty of stores to purchase personal items and drinks such as beer, wine, scotch and spirits. Daily schedule goes as follows: Breakfast is at 6:00 AM. Lunches are buffet style and designed as a do it yourself program, enabling you to create your preferred sandwiches with just the right amount of food. There will be a variety of meat, cheeses, and bread for making sandwiches, as well as fruit, cookies, rolls and juice. 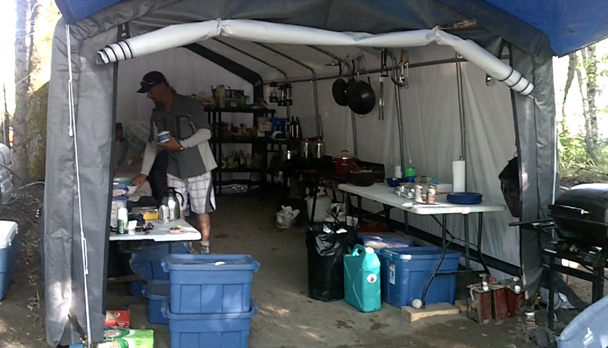 In the colder months, hot soups are prepared and served in personal Thermos containers for on the river. Thermos of coffee or tea are available. You will be on the river for a full day of fishing with your guide. Be sure to bring your lunch and grab a couple bottles of water from the wader room for on the river. Around 5:30 PM you will be back in the truck and on your way back to the lodge. After returning to the lodge, enjoy a cocktail and share the highlights of the day with the other guests. Dinner is served at 7:00 PM. 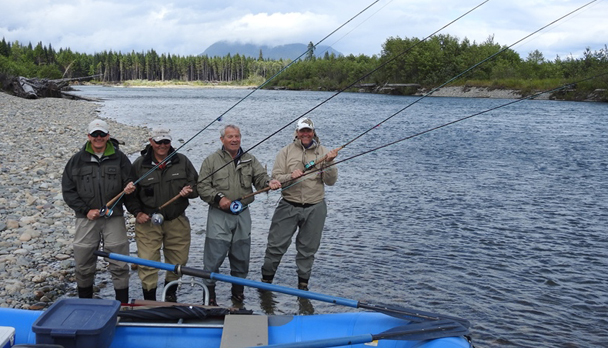 There are two lodge possibilities in this program, they both offer the same services and amenities, but different infrastructure, located on the Skeena. They offer an ideal combination for nature and fishing lovers with double and and single bedrooms; dining room; a bar and a very comfortable living room. 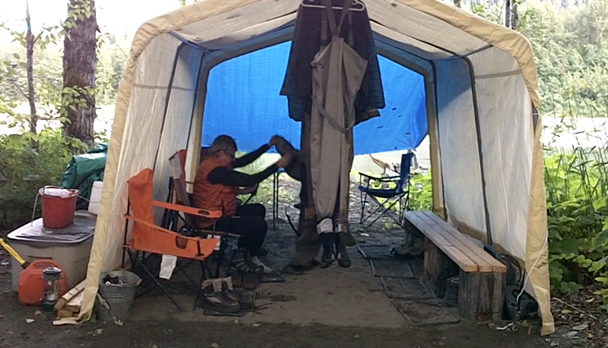 The lodges also have a wardrobe area where anglers can leave their waders and fishing equipment. There's also Wi Fi serive. Rod, reels and lines: Single hand #7 to #9 Wt of 9 to 10 ft- fast or extra fast action. Spey rods if preferred #10 and #11 Wt of 13 to 14 feet long; a reel with an adecuate drag system capable of holding 150 yards of 30 lb backing. Sink tip leaders should be 2.5 to 4 feet long. We use Maxima Ultragreen exclusively, in breaking strains from 10 lb test to 25 lb test. For most wet fly applications, 15 or 20 lb test is used, though 25 lb test is often used when targeting Chinook on the fly. 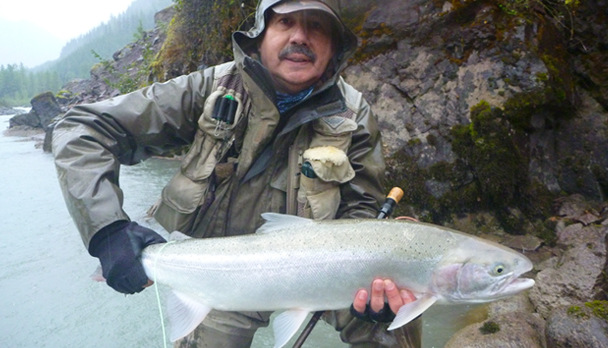 The recommended leader system for dry fly steelhead fishing is very simple. Start with a 12 to 15 pound tapered 9 foot Steelhead or Big Game tapered leader with the addition of 2 to 4 feet of 10 to 12 pound Maxima Ultra Green tippet. 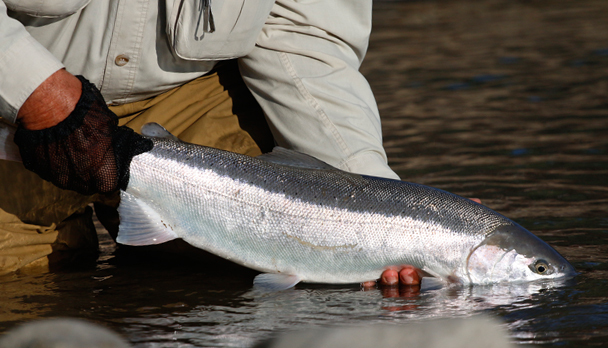 Fly patterns: Your choice for Steelhead and Salmon flies sizes from 4 to 2/0. We highly recommend; Intruder, Pick "Yer" Pocket, Popsicle, Fish Taco, Starlight Leech, String Leech, Egg Sucking Leech, Trailer Trash, Grantham Sedge, Steelhead Beetle, Copper Wulff, Bunny Bou, Hawaiian Punch, Skeena Series, Terrace Flasher, Skeena Flasher. Also bring: Hooded Rain jacket, Waders, Wading Boots, Gloves and Hat/Cap. Boat bag, Line clippers, pliers and hook file/sharpener. Polarized sunglasses, buffer, stripping fingers and sunscreen. Rates include: Transportation to and from Terrace Airport; 6-night accommodation; all meals; 5 full fishing days. Some fishing tackle. Rates do not include: Round trip BC; personal insurance; fishing license; fishing equipment and flies; alcoholic beverages; gratuities. Canadian taxes (2 to 6%). Rates include: Transportation to and from Terrace Airport; 6-night accommodation; all meals; 5 full fishing days. 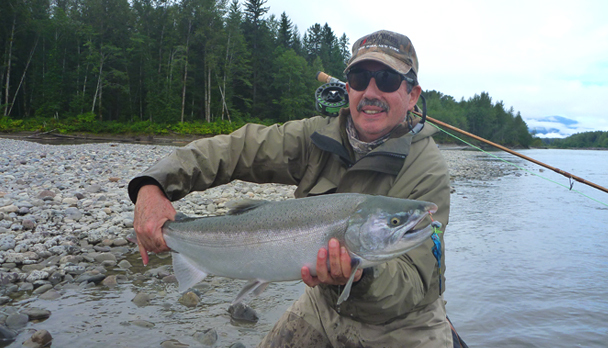 The season is starting this days and some Steelhead, very bright hard fighting and healthy, have been seen entering the Skeena, pushing into the 20 lbs range. Recomendamos este programa! / We highly recommend it! I wanted to thank you for organizing our recent trip to British Columbia, once again everything went outstanding. I wanted to highlight the good service delivered from the Wild Rivers Lodge, where the lodging, food and hospitality surpassed our expectations. 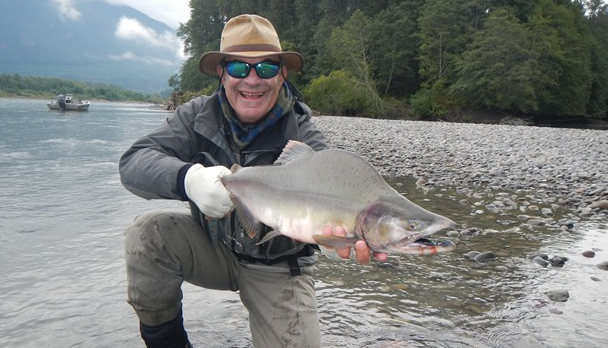 As far as the fishing, we did it in two rivers, the Kitimat and the Skeena. 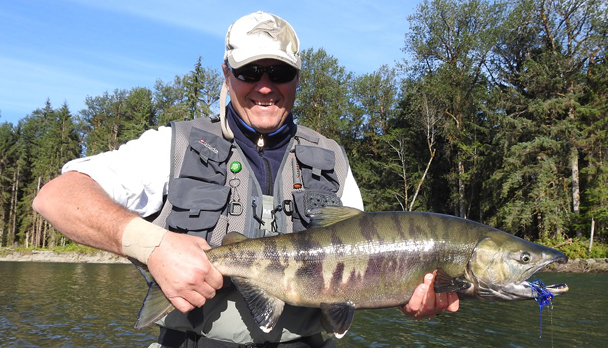 The Skeena was still with too much water which made it harder to fish, but in the Kitimat we were able to fish a lot of Pink and Chum, these last weighted between 17 and 26 pounds. We were a group of four anglers and we actually lost the count of hooked salmon! It was a lot of fun and the guides were quite friendly. We fished with one and two hand rods and the three guides we had showed enthusiasm in teaching us the spey casting, a new technique for us. We believe it is a highly recommended program. Thanks again and we keep in touch for further trips. 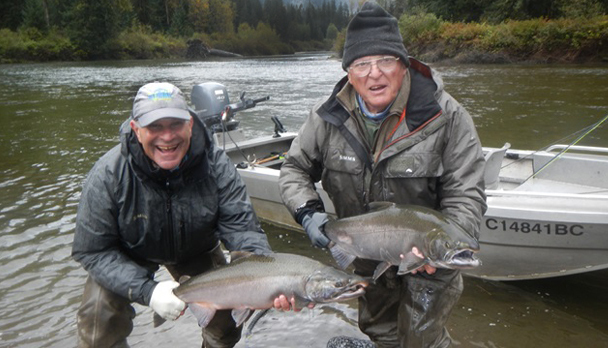 Here are a few words about our experience of the fishing in Terrace B.C and the stay at the Pioneer lodge 28/9 ? 5/10 2014. Overall the package works very well with an individual pickup at the airport, a short transfer to the lodge and a personal greeting upon arrival. The lodge is robust and comfortable with the sleeping accommodation in small log cabins and across the yard, the main lodge for meals and socializing. 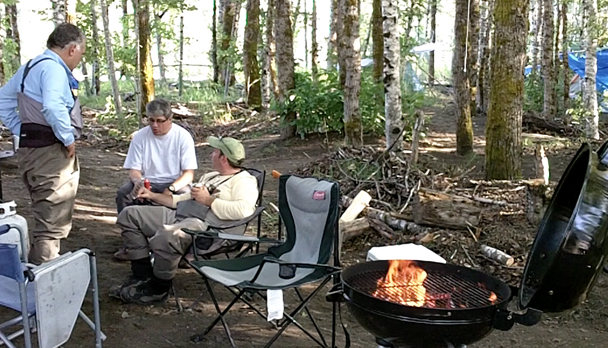 Food and sleeping quarters are generally of high class and the lodge really works for a group of fly fishermen. During our week the conditions were far from ideal but the guides did their best to find good waters to all the clients. 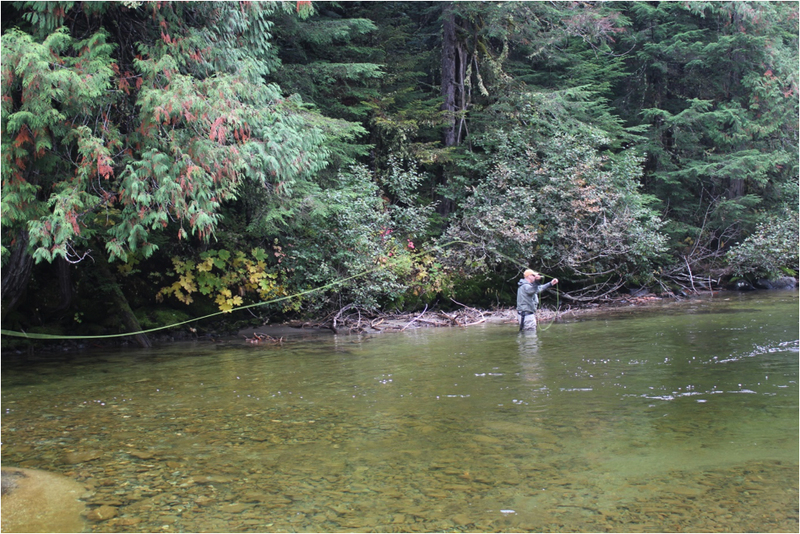 From my perspective, I had the best days hiking the smaller streams and rivers in hunt for the illusive steelhead. To hike the area I would say that you need to be reasonable fit and have a sure footing due to slippery conditions. Single hand rods in 6-8 weight and a full floating line with a long leader was the best choice. As for flies, the best patterns were small weighted streamers in candy colors as light blue and pink with a lot of flash. The best experience of the week was fishing the amazing Copper river (one of the tributaries to Skeena) about 40 km upstream. After an adventurous hike through ancient forest we reached a couple of spectacular pools that according to our guide were stocked with steelhead. He was right of course and we hooked about 10 and landed 7 steelhead, the biggest of about 15 pounds, during the day. We spent our last day fishing the superb and scenic Kasiks river. After a short drive our guide landed his jet boat and we began an upstream journey to seemingly endless schools of Coho salmon. The scenery was indeed breathtaking with steep rock faces, waterfalls and an abundance of wildlife. Fishing was almost too good, with plenty of 10-20 pound salmon striking our weighted streamers from all angles. After 12-15 fish each (I actually lost count) we called it a day, took a cup of coffee and just enjoyed the moment? To summon it up; despite less than ideal conditions we had an fantastic week of fishing the Terrace area, just imagine the possibilities with the mighty Skeena and all the tributaries clear and fishable.. I can strongly recommend a trip to Terrace B.C and a fishing experience of a lifetime?. My second experience in Terrace was different from the one I had las t year. We departed on September 28 from Vancouver airport and after 1,5 hours flight we landed in Terrace, where we met Chad. It was about 7pm, it was already dark and raining. We went into town to get some wines and liquors and headed to the lodge. The Pioneer Fishing Lodge gave us a very nice impression. Guests had already had their dinner and we met Jorgen and Kent, two really good guys form Sweden, who were going to join us for the rest of the week. 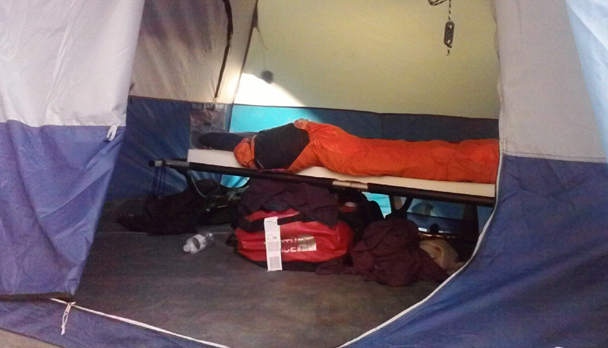 Since the fishing starts very early, around 5.30am, we got settled in our rooms and went straight to bed. Our first fishing day. After meeting Jezz Crosby (a real character!) and his wife Pip, owners of the Lodge, and having a regular breakfast (coffee, toasts, juice, fruits and eggs if wanted?) we prepared our equipment and off we went fishing. Our destination was going to be the Kalum river with Dustin, hoping for Coho and some Steelhead, but Dustin the day before made an extra effort and was in back pain unable to go out, especially with the bad weather conditions: dirty waters and low visibility to see the fish. 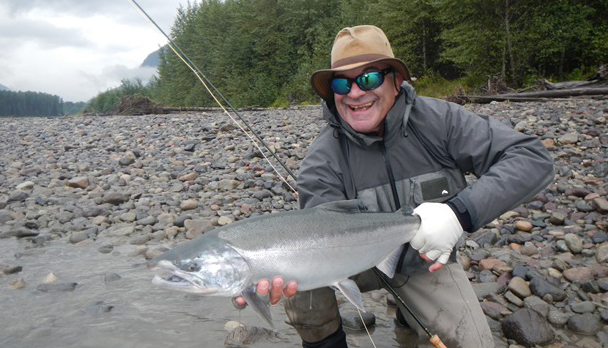 We went to the Skeena instead with Chad, but despite his effort and after the extensive miles of search for fish, as my partner said, it was a day of ?two hand rod?. We only had a couple of hook ups and that was it. During my second cast, my rod broke down but thanks to the well-prepared people of Nicholas Dean, they gave me a spare one they had for backup. All wading fishing, the skiff is only for transportation. The lunch was simple and fast on the skiff, a sandwich and a fruit, not much inspiration. We went back to the lodge after 5pm, took a shower, some appetizers were served and the dinner. Dinner, is always served at 7pm, on time, and it?s all a ceremony. Dishes with a spectacular presentation, well elaborated and delicious. Every day, the chef Jeff, another special character, presents every dish to the table. During dinner we met to English and a Canadian from Toronto, who were also fishing with us sharing the week. We ended up forming a nice group! Tuesday, the bad weather continued and we headed towards the Kasics river with Sky. What a wonderful fishing day! The river was pretty clean, our fishing mode was casting from the skiff with single handed rods, Daniel and me fishing at the same time. Daniel landed 17 Coho salmon and I landed around 10, some of them really silver and fresh, approximately between 9 and 13 lbs. We came back very happy to the lodge. Wednesday we repeated the Kalum since the Skeena wasn?t giving that much fish and later on with Dustin recovered, we went to the Kasics and between my partner and I we landed 35 Coho salmon. What a day of getting tired of fishing! Haha. Thursday the weather was horrible so we decided to do some tourism in Terrace. Friday the only good river fishable was the Kasics, so we headed there with Sky and repeated the success of the previous days. I would like to address the good will and effort of Chad to help me with a health issue I had during the week, taking me to Terrace to the doctor and helping me feel better. Overall a good fishing, despite the bad weather, great food and drinks, the place very nice and comfortable and especially the nice company we had along the week. Sharing this passion with you after many years us still a blessing. 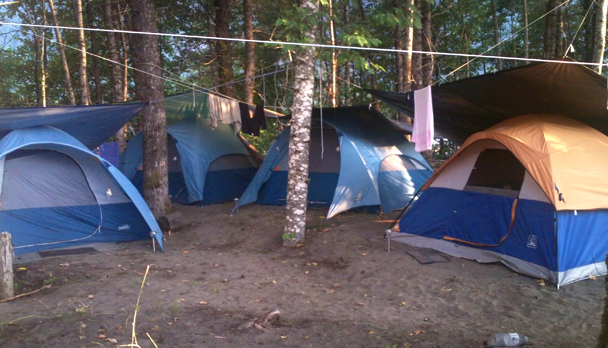 We loved the place, and the camp was very good, comfortable and nice. Very well fed I must say! Steve, Dave and Ryan were our guides and camp staff, highly professional and with an amazing human quality! We were lucky with the weather, no rains only one windy afternoon which we fished in long sleeves. The fishing was regular, we didn't catch any "trophy" Jose luis caught a 15 to 18 lbs Steelhead, I hooked a 13 to 15 lbs Coho, Guillermo and Carlos also hooked some Coho and Steelhead each. We all fished Pink Salmon and some Sockeye, some baby Coho, Steelhead and even a baby Chinook. We were pleased to see the jump, run and loose of a 44 lbs Chinnok hooked by Ryan! It left us astonished! 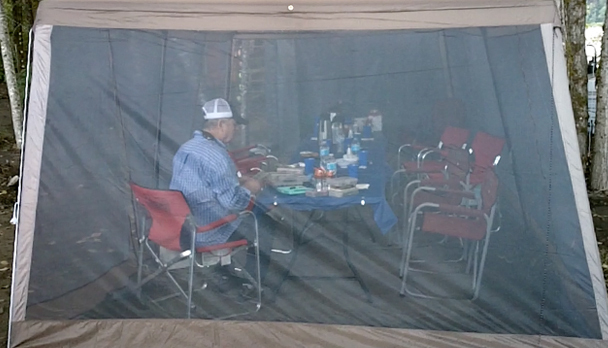 I'm sending some pictures of the camp and fishing in general. Thank you for organizing the trip. After many hours of flying, connections, airports, I finally arrived to Terrace from Vancouver where Chad was waiting for me at the airport, ready to drive me to the lodge and meet the rest of the group. The lodge was pretty good, comfortable bedrooms with an amazing view of the Skeena river. During our first day, we went fishing to the Cooper river with our guide Jeff. 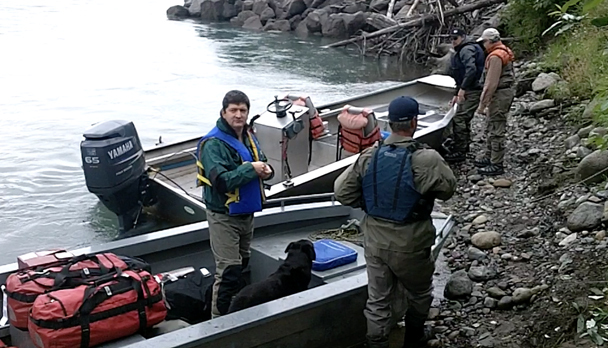 Due to the raining and adverse conditions, the river was turbid and had low visibility, the fishing was pretty tough. Despite this, I landed my first Steelhead of 10 lbs. and later on with Raul we both landed a Coho each. That was our fishing for the first day, moreover while returning to the lodge we broke a tire and had to change it in the worst raining moment of the day! So our first feeling was a bit disappointing. Fortunately, the following days were wonderful. 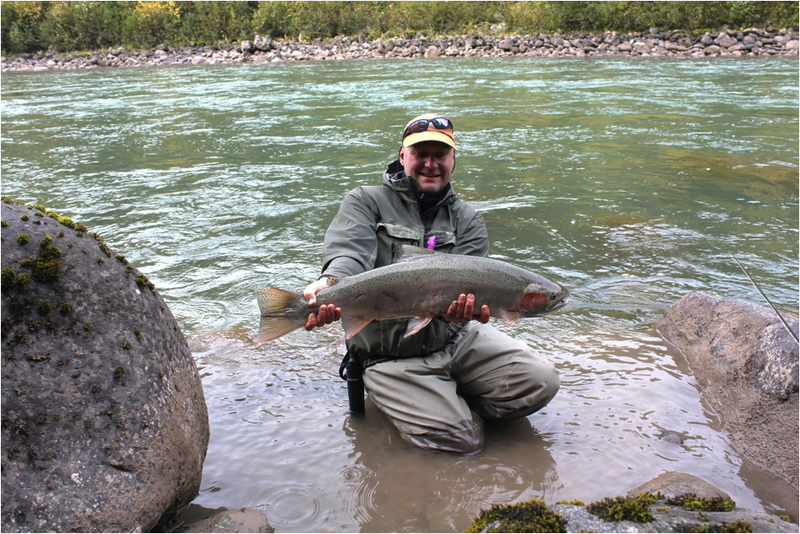 The Skeena is an amazing river, not only by the beatiful landscape that surrounds it, but for its easy access, its fishing, and comfort. Every morning we had breakfats at 6.30am, preaperd our lunch and at 7am would head off with our guide Dustin Kovacevic, Raul and Daniel in a boat just for us. Dustin is an excellent guide, very professional and entertaining as well. 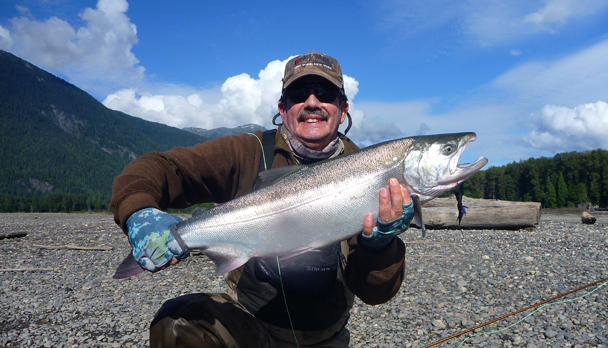 The following days we fished a lot of Pink salmon of 3 to 6,6 lbs. and many Coho of good sizes; who gave a formidable fight, fast and powerful. Raul fished his first Steelhead with Spey. The experience of fishing in a visual paradise, in which black bears and many other wild animals such as bold eagles, wolves and dears? parade in front of you, is unparallel. 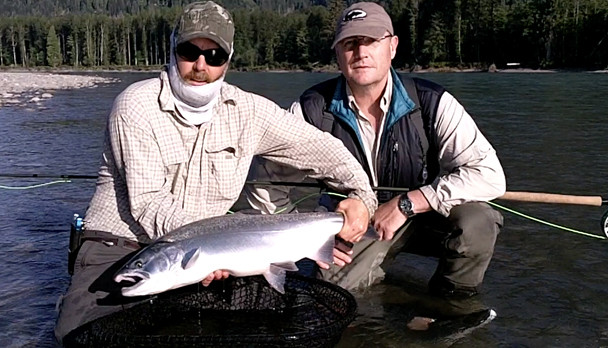 My best capture of the week was during the last day, a Coho of 16.5 lbs., a total record for me! Arriving to the lodge after the whole fishing day, tired, was always a comfort not only because we gathered with our wives but also because they were waiting for us with some drinks and appetizers. After that, we had an exquisite dinners every day, in a cozy and warm atmosphere and finally to bed. I hope to repeat this grateful experience next year! 5:30am and it's raining, our first fishing day and we only hear the water drops on the Lodge's roof. It's beginning to clear, but clouds are still low and the mist covers the landscape, our visibility is not further than 100 mts. 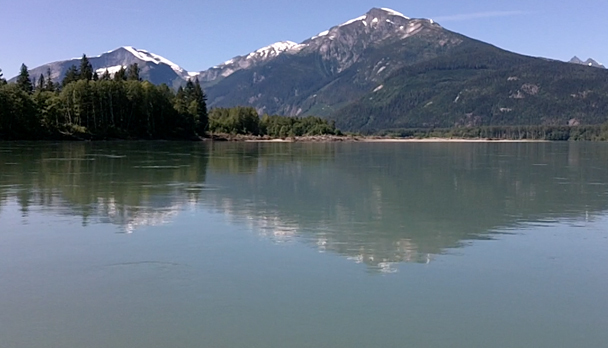 We are a few kilometers downstream from the town of Terrace, and around 200 mts from the Skeena river. Surprisingly it's not cold, the weather is 55 / 57 F�. After breakfast and preparing our lunch, we put the eader on and check for second time our fishing equipment. Guides arrive in different truck with their trailers and lanchas con motor fuera de borda, we complete a for for the fishing license and that's our ritual every single day during our stay. 7.30am finally we're on our to begin pur fishing day, the group gets divided in 2, to fish different zones. The Skeena river is one of the few ones of Canada that doesn?t have a dam, fishermen, local villagers and conservative associations have struggled for years to avoid any kind of construction that might interfere in the migration of the many millions, yes millions of salmon and Steelhead that come upstream to spawn. 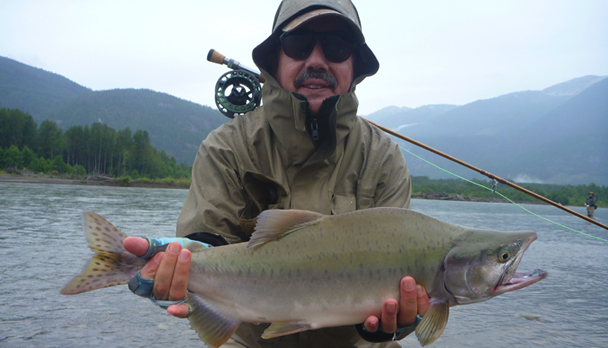 The Skeena has more than 600 km length, in which many other rivers and streams such as Kispiox, Cooper, Sustut, etc... known for their Steelhead, tribute. Before the river fusions with the sea, along its last 70 to 80 km, it becomes quite wide with many channels and sand banks. As I mentioned before, salmon (Pink, Coho, Chum, Sockeye and Chinook) and Steelhead, go upstream the Skeena river to finish their reproductive cicle and then die, all the Pacific salmon once they spawn die, except the Steelhead which can repeat the same cicle 3 or 4 times before they finally die. This fantastic life and death cicle is what gives this river a very high biologic value, not only for the high Steelhead and salmon reproduction number (over populated) but for its input to the nutritive food chain comformed by bears, bold eagles, wolves and other native species. Between June and August there's a massive salmon run, heading the quantity list are the Pink, then Sockeye, Chum, Coho and Chinook. 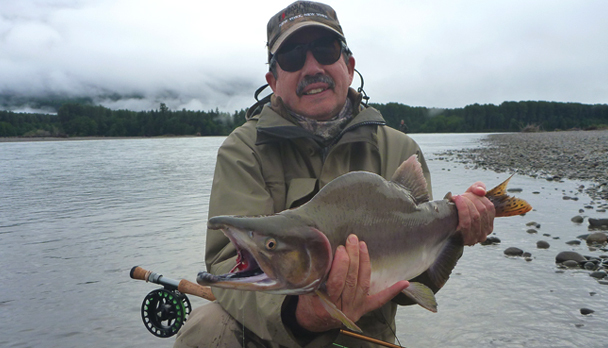 It can also be found in the river other salmon such as Bull trout and Dolly Varden. Skeena is a turbid, greenish river, with a maximum visibility of 1 meter except when it rains which the dicreaseas dramatically. Once in the river, clouds started to dissipate, leaving in evidence the special and spectacular landscape; closed woods, different types of conifer of up to 90 mts high, abrupt mountains with immense blocks of rock at sight and a heavy mist that emerges from the river, giving its magical touch to the view. During this season, actually during the month of August, the 5 salmon species and the Steelhead as coincidence go upstream at the same time. During the other months, the species vary a bit, less of ones and more of others... so bascally sometimes you don't really know what you've hooked until it's near you. So the type of flie and the leader have to be good for any of these species. 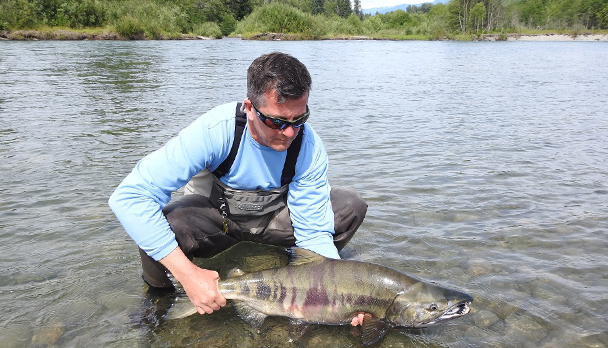 Another characteristic of the summer fishing, is the fact that salmon and Steelhead swim upstream through the river parts with less current , so they don't lose strenght. The water's depth vary between 20 and 50 cm?. It's amazing that fish 10 kgs or more can swim in that shallow water! 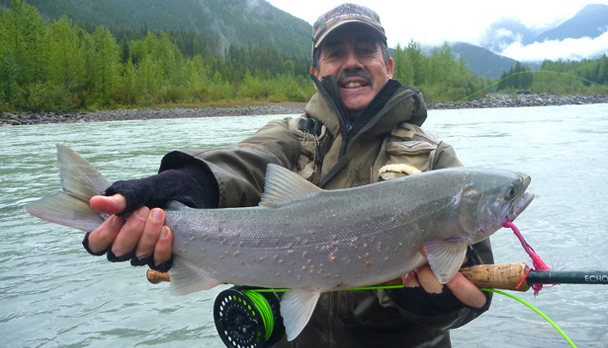 Except for some tributaries which alow the use of dry flies (due to their clarity) "skate" over the surface, it is impossible in the Skeena river, allowing exclusively the use of streammers with sinking tippets of diverse density, with a 20 lbs leader. 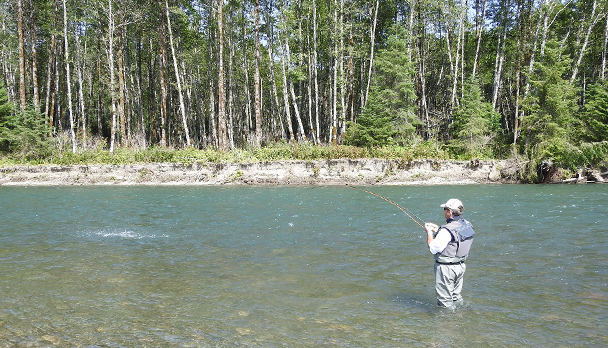 It's pssible to fish with one hand rod (ideally #8 wt), but also a double handed rod suits the ocassion (# 7 / 8 wt of 13 ft). The fishing techniques in this period requieres a cast between 15 and 20 mts, if possible upstream, starting with a line correction and then leaving the fly drift until you start recovering the line when the drifting is over. In general, most of the bites / hook ups are while finishing the trayectory but sometimes they might surprise you in the middle of it. Flies are "hard" to choose the right ones because literally there are thousand of models, but guides here prefer pink ones, or pink with violet, a bit weighted and very shinny. They also suggest blue with violet and sparkle for Coho salmon and Steelhead. 99% of the flies (sinking) I've seen are articulated. The style of hook up do not differ very much between the species, since all salmon including Steelhead attack the fly by irritation, so until they don't show a reaction, you don't really know what has bitten. Though many times Coho and Steelhead give a hard battle form the very begining, including jumps and runs, not common in the rest species (Chinook is the exception since it's the strongest one). 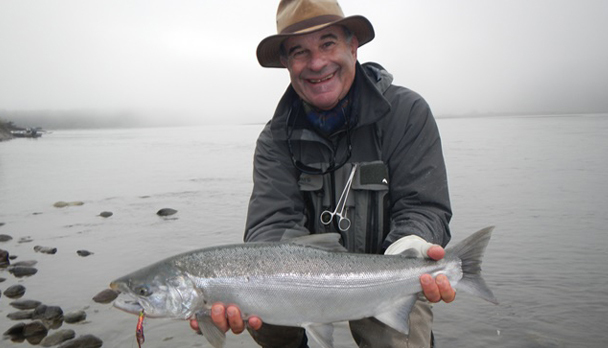 Since Pink, Sockeye and Chum go upstream in larger quantities, the odds of fishing Coho, Steelhead and Chinook are lower. When you hook one of these last species, it's important not to hurry the landing, sometimes they might give the impression of tyred but they're not and therefore you can lose it. Another characteristic of this kind of fishery is that they don't stay long in the same spot, they are always going up. This means that if you're in the right spot where fish go through their way up, then you'll fish the whole day without changing place. Usually guides recommend to move, so you get to know other spots of the river and have different experiences everyday. At 5:00pm we returned to the lodge, had dinner by 7:00pm, still under daylight and around 10:00pm we were all sleeping. The wethear during the following days was more or less the same, but with less rain, lots of clouds, no wind at all and a temperature between 15 and 20 C�. The only excepction was on thursday, with plenty of sun and not even a cloud. Through our 5 fishing days, among the 5 anglers we travelled, we landed a total of 350 Pink salmon, 28 Coho (being the biggest one of 15,5 lbs), 9 Steelhead (the biggest was 13 lbs), many Bull Trout, some Dolly Varden, a pair of Sockeye and 1 Chum. British Columbia caused me a very good impression and had a gratefull experience. Its exhuberant nature, rivers and lakes, the majestic glaciers, its varied fauna and rich maritime cost and over all the passion and respect canadians have for their natural environment and its rich resources. It's a destnation that invites to to go backand with no doubt reapeat the particular and intense experience. So if everything goes as planned, next year 2014 we'll be giving more fight to the Coho and Steelhead, in the Skeena and its tributaries!